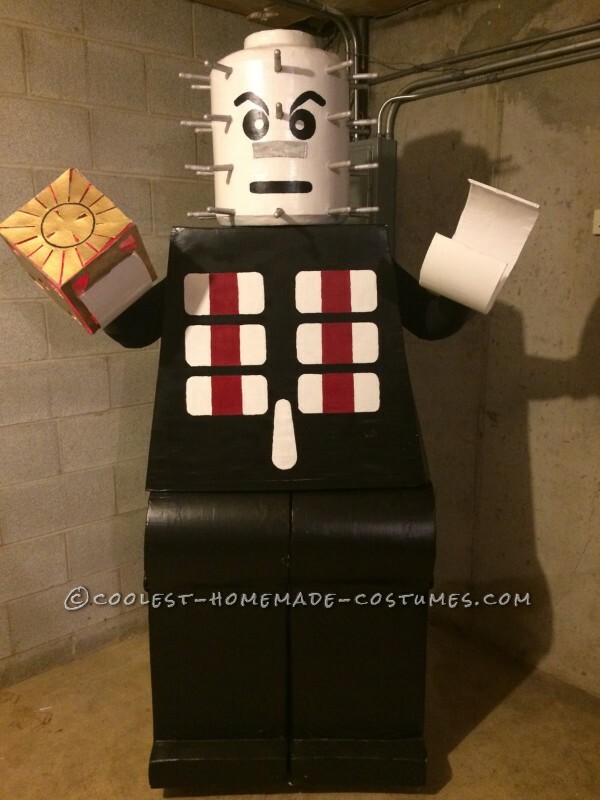 When the Lego Man movie came out, I knew right away what my next costume was going to be LEGO MAN! 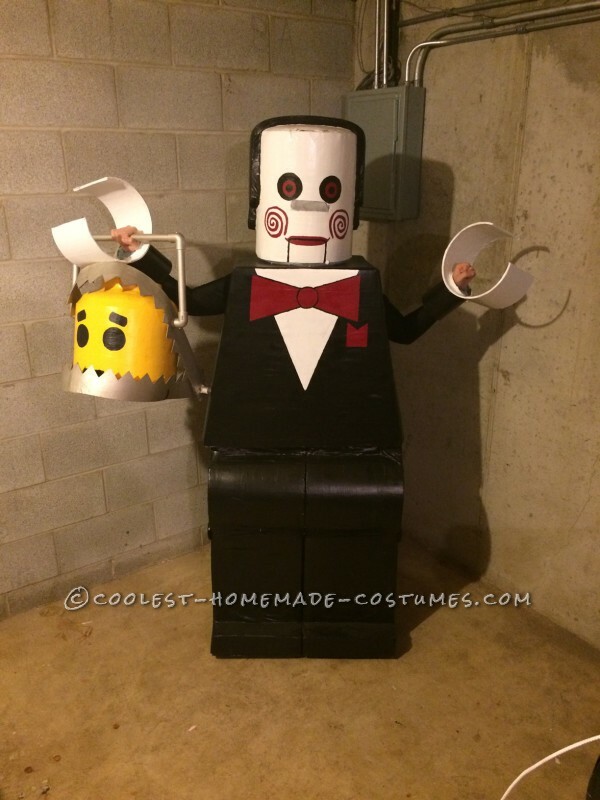 I have seen a few really good Lego Man costumes over the years, so I wanted to take it to the next level and add a specialist twist for Halloween, LEGO MAN HORROR VILLAINS! I grew up on scary movies and what better way to show my appreciation than to make my favorite scary movie villains into Lego Men! I hope you enjoy the costumes as much as I enjoyed making them! Feel free to ask any questions; and the Lego Men are available for birthday parties, LOL! 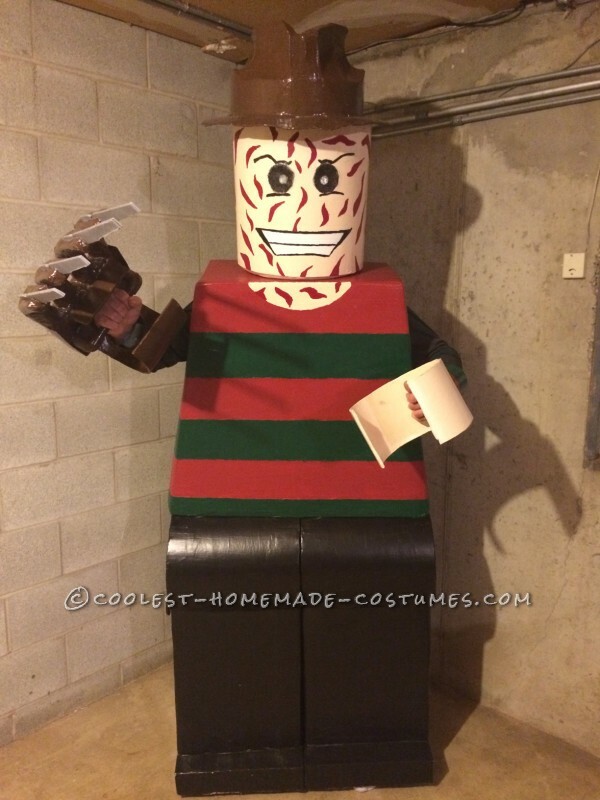 I really enjoy visiting Coolest Homemade Costumes and this year I went all out with costumes. If you have time, please check out my other costumes I submitted this year, and let me know what you think. The first step and maybe most important step was to create the base for the Lego heads. 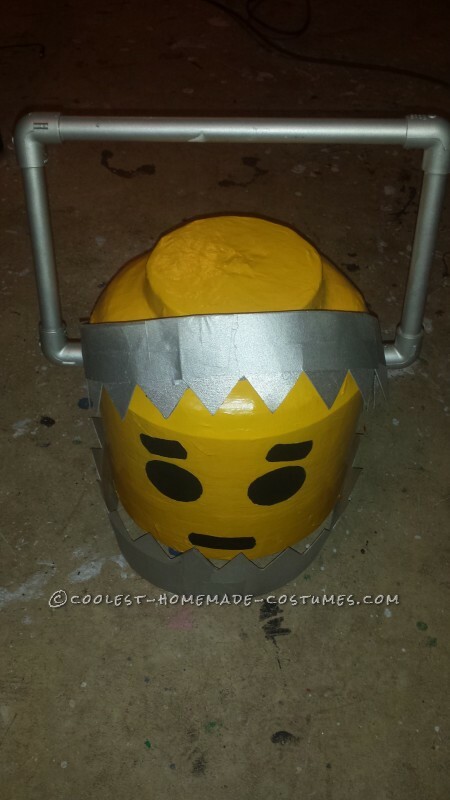 I started with a 12″ cement tube for the four big heads, and a 10″ cement tube for the two little heads. I measured from my shoulders to the top of my head to determine the length of tube I needed. 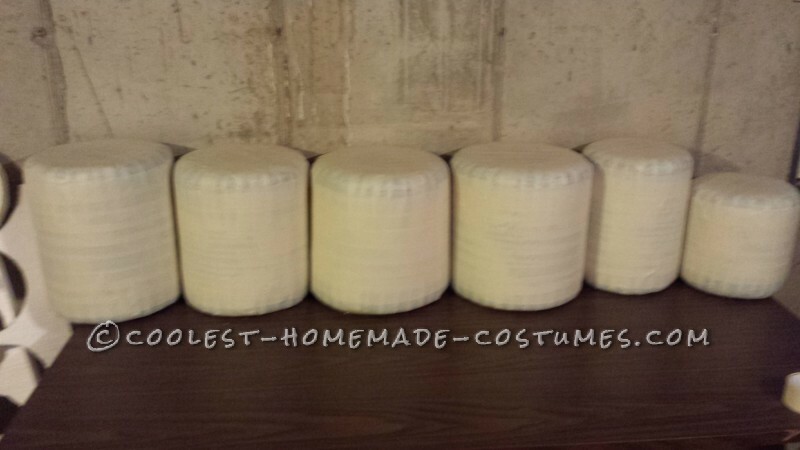 I added in an extra inch to the measurement for added padding later. 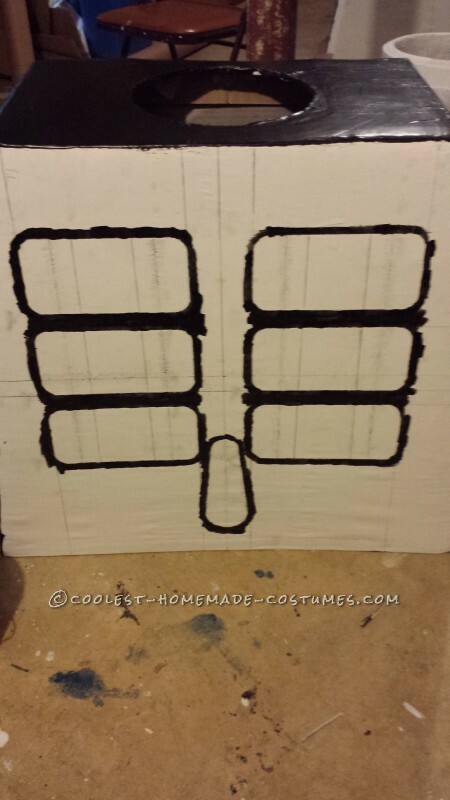 Using 1″ Stryrofoam, I traced the outline of tube on the foam. I cut out the circle shape and used it to seal the top of the tube. To add depth to each head, I used memory foam from a queen size bed topper. 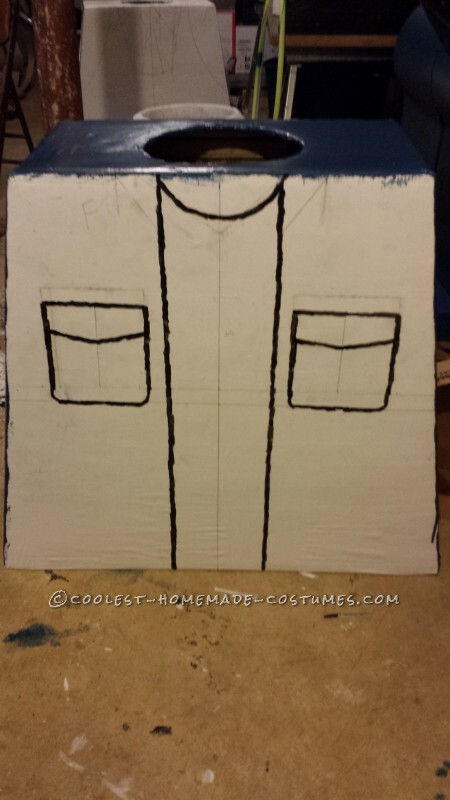 Once the head was wrapped in foam, I used masking tape to create the rounded edges of a Lego head. I added three layers of masking tape to each head to use as a base for paper mache. 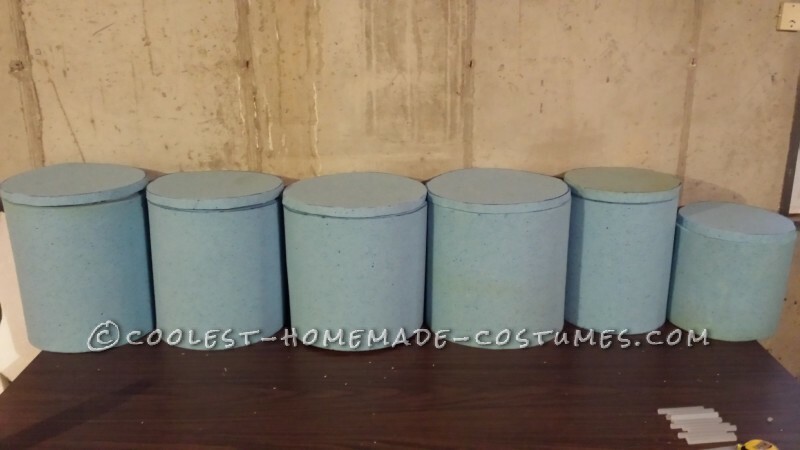 I used the circle of a paint can on 1″ Styrofoam to create the tops of the heads. Each head was covered in 6-8 layers of paper mache. This step is very important so the head forms a solid base and will not fall apart with use. Cover each head in a coat of primer paint. I used a spray paint can for the circle outline of the eyes. Once the face was outlined with all of the details needed, the heads were painted. I went with three layers of paint to get a deep clean color. To see out of the heads, I cut a rectangular opening in each head and used wire mesh to help hide the eye holes. 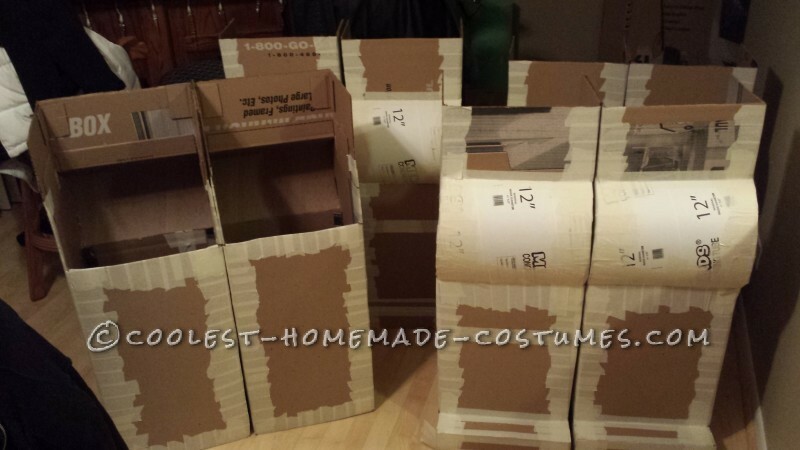 To start making the body and legs of the Lego Men, I used standard moving boxes. 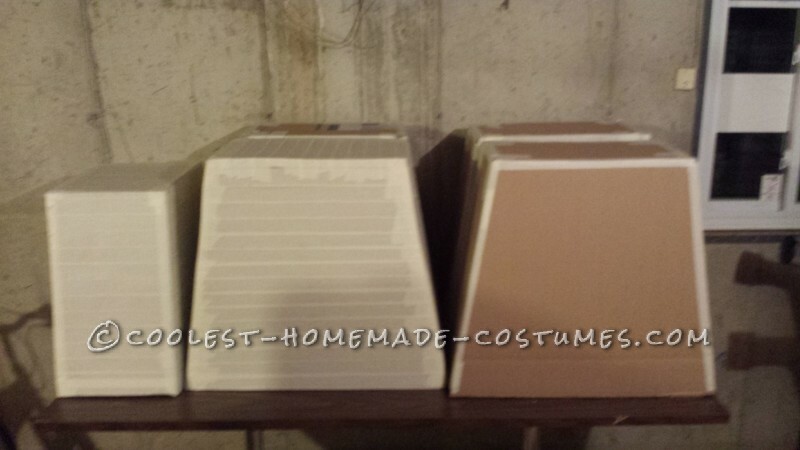 10 Large Mirror Boxes – These boxes work best because of the wide flat surface. To create the exact size needed, I measured a regular toy Lego Man, and scaled it to full sized based on my dimensions. A good way to start is by measuring the width of your shoulders and then the length from your shoulder to you waist for the chest. To create the desired look, I needed to make sure the bottom of the chest piece was a few inches bigger than the top shoulder measurement. Once I had the size of the chest, I could create the legs. The width of the legs were 1/4″ smaller than the bottom of the chest piece. This allowed the chest piece to slide over the feet leaving no gaps. To determine the length, I measured from my waist to the bottom of my feet. I added five extra inches to the top so the chest piece would have something to slide over. 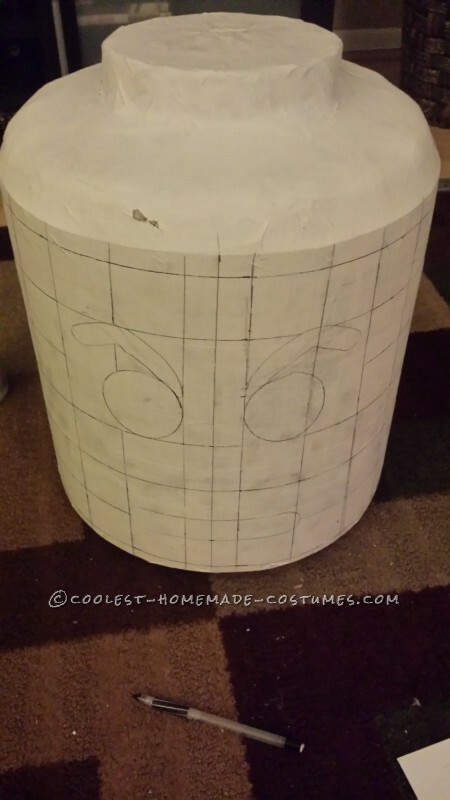 Using 12″ cement tube again, I cut it in half to create the rounded shape of the front of the feet. Once I had the shape of feet constructed, I ran a closet bar through the legs so they would be connected together. I then attached a rope loop to the bar inside each foot so I could wear the legs like overalls. Make sure the feet are at least an inch off the ground so you can walk. I also cut down the back of the feet so I could easily get in and out of the feet. Your lower backside will be the only part of you that is exposed while in the costume. 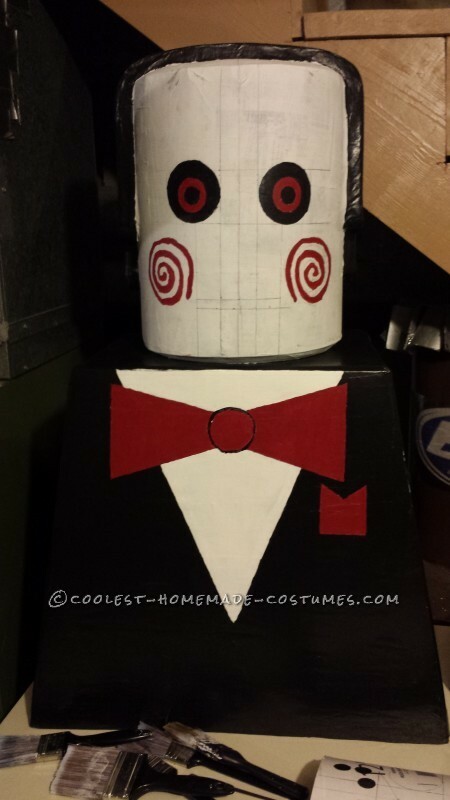 Finally, I added a few layers of masking tape to the chest and feet, 6-8 layers of paper mache, and three layers of paint. The main materials used for the hands were poster mailing tubes and 10″ cement tubes. First take the poster mailing tube and determine the length you need. The length should be enough to cover your wrist and then another few inches. Next, I used a 10″ cement tube and cut it to the width desired for the size of the hands. Once I had the tube cut, I needed to make the opening for the hands. I cut out about five inches of each tube to achieve the look of a Lego hand. The final step was to trace the circle part of the mailing tube on the back of the cement tube. I then cut out the hole in the cement tube and slid the mailing tube in and glued it down. 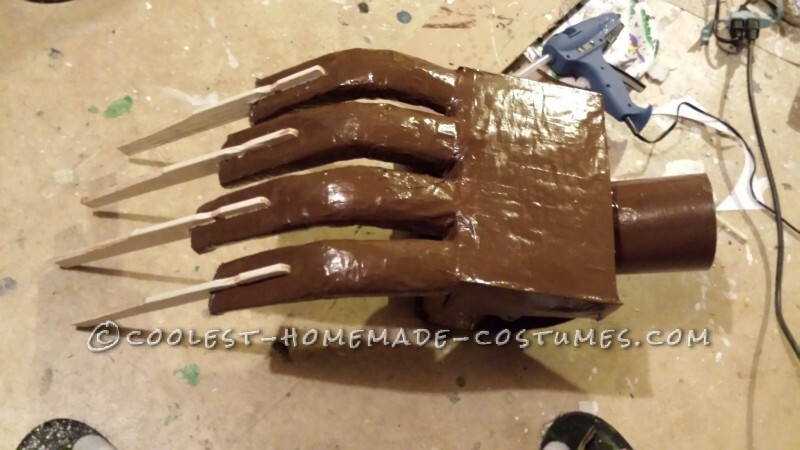 This allows for you real hands to be free to hold props for your costume. I also added some foam into the inside of each mailing tube to create a more snug fit around my arm. To add to the details of each Lego Man Horror Villain, I made sure to give each Lego person a prop! 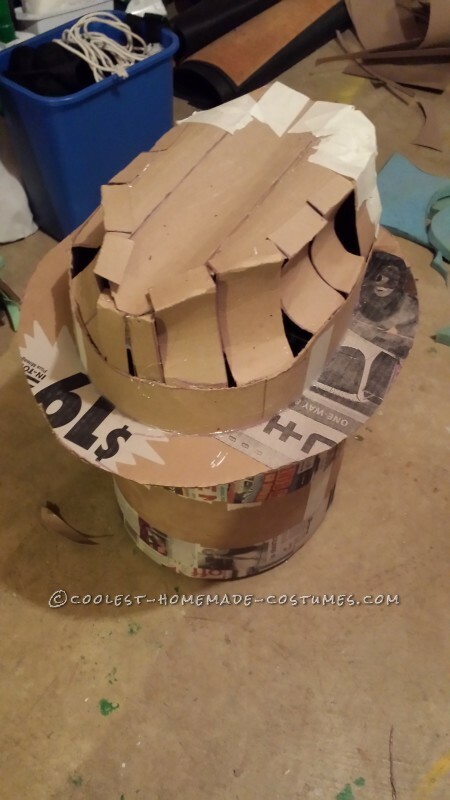 The hat was made using left over cardboard from the large mirror boxes and mailing tubes. 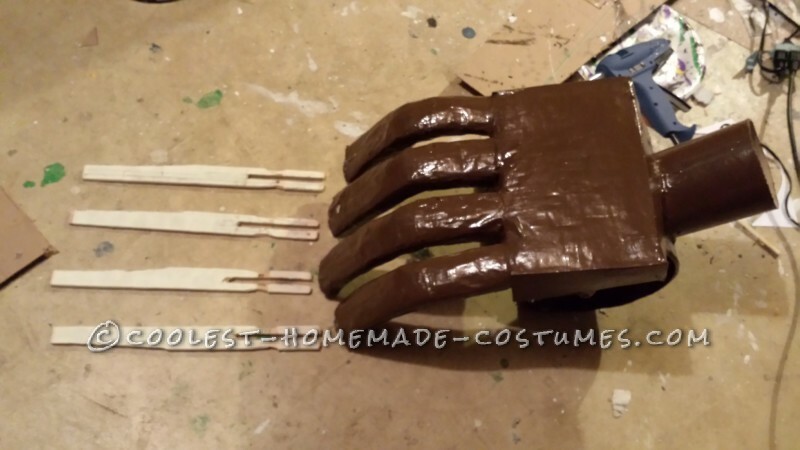 The base of the hand was constructed from 1/2″ PVC pipe. Forgot to take a picture of how it looked. :(. For blades, I used paint mixing sticks and cut them down to the look of knifes. 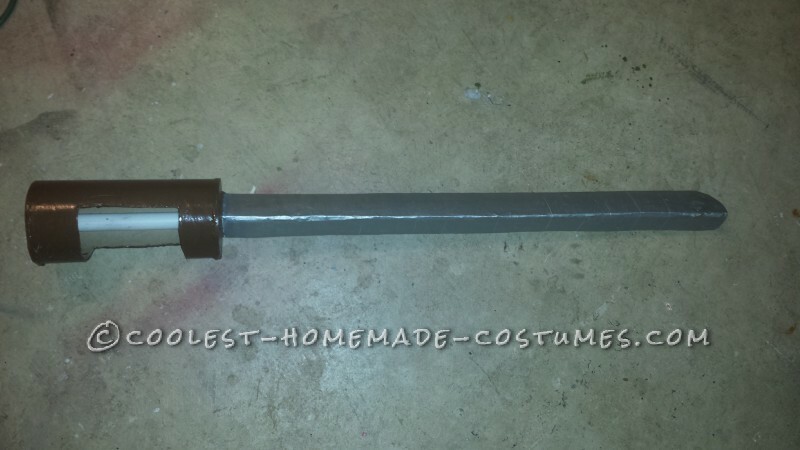 I started with 1/2″ PVC pipe for the length of the blade. For the handle, I used mailing tube. The main part of the blade is cardboard. It was designed so my hand could hold the Machete making it look like the Lego Man was holding it with his hand. 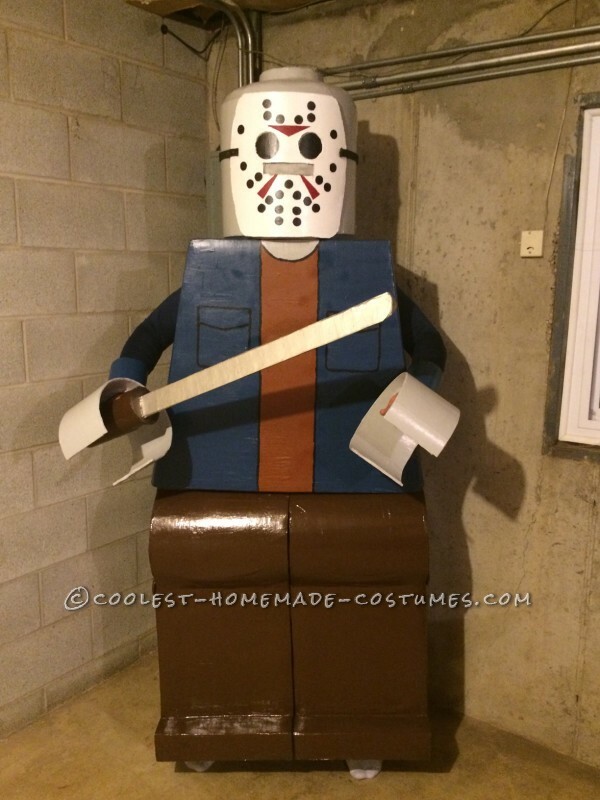 The mask was made from 12″ cement tube cut down to the shape of the mask. A piece of elastic was used to secure the mask to the head. 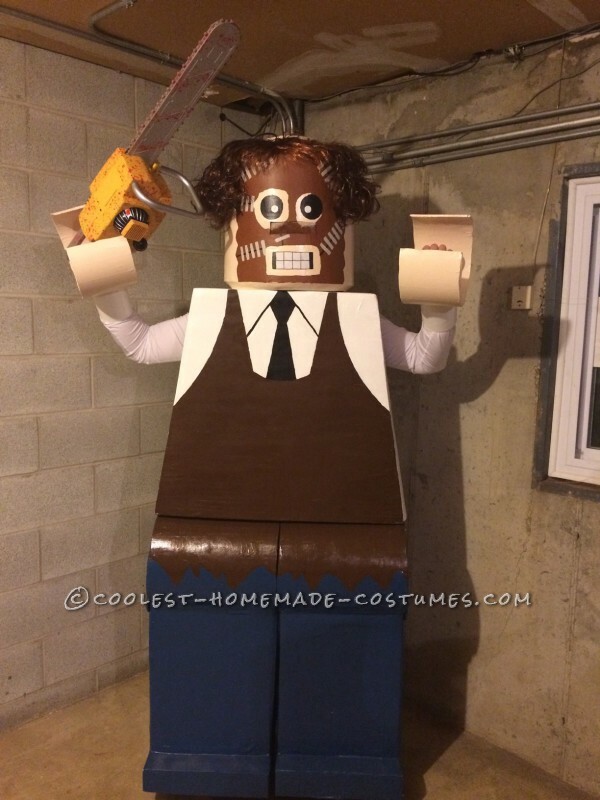 The chainsaw was bought at a Halloween store. The chainsaw was fully operational with sound! The box was constructed using plexi glass for the base. 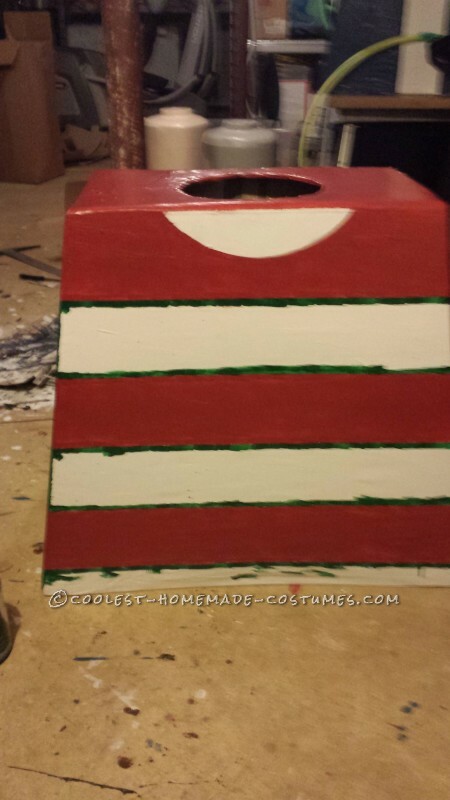 Inside the box, I added red lights to make the box glow. The outside design of the box was made by construction paper painted gold. The pins were clothes pins used for laundry painted silver to look like pins. This was the most complicated prop to make since I had to make an additional Lego head just for the prop. Just for the fun of it, I made the head functional just in case someone wanted to wear it. The bear trap part of the prop is made from cardboard. The handle is made from PVC pipe. 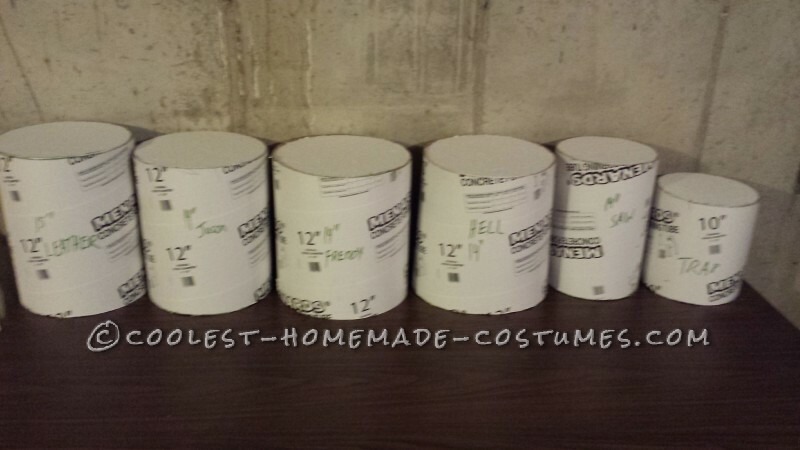 Hard to say exactly how many hours the costumes took to make. 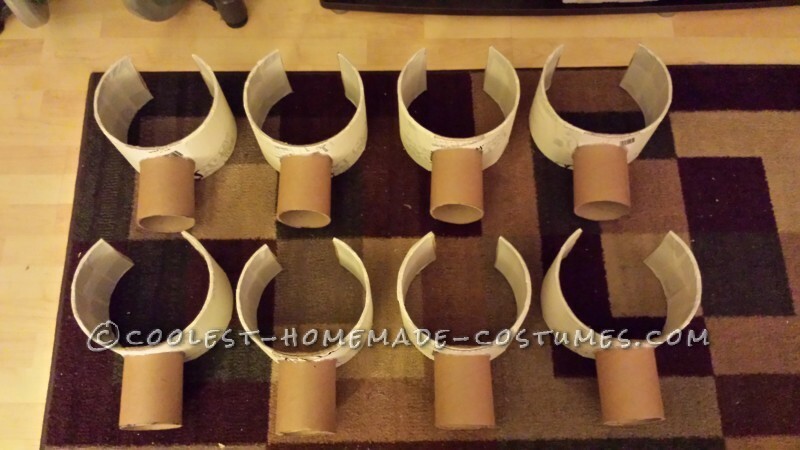 I would guess 50-75 hours to make all five costumes! 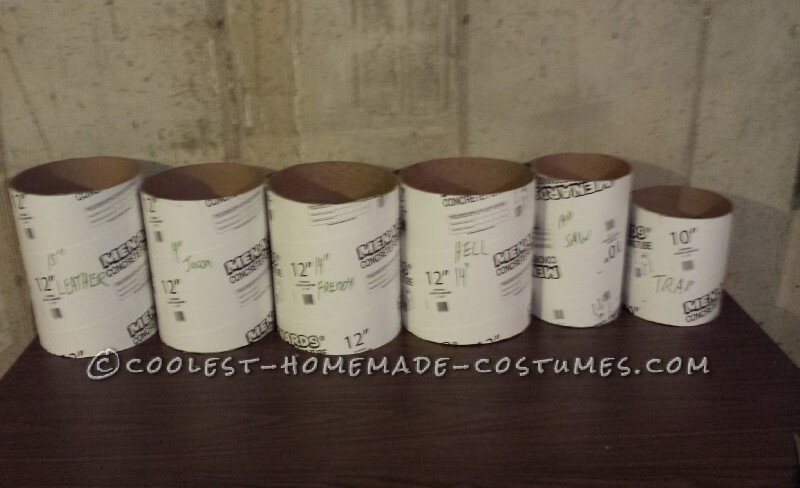 When you love making costumes, it’s not considered work! The average cost of each Lego Man was $100 ( Paint is expensive). Requirements – three friends that enjoy Halloween, and one patient wife! On Halloween, we wandered the streets a little, and more than a couple of cars pulled over to take pictures with the group! We were even able to win BEST GROUP COSTUME on Halloween night! 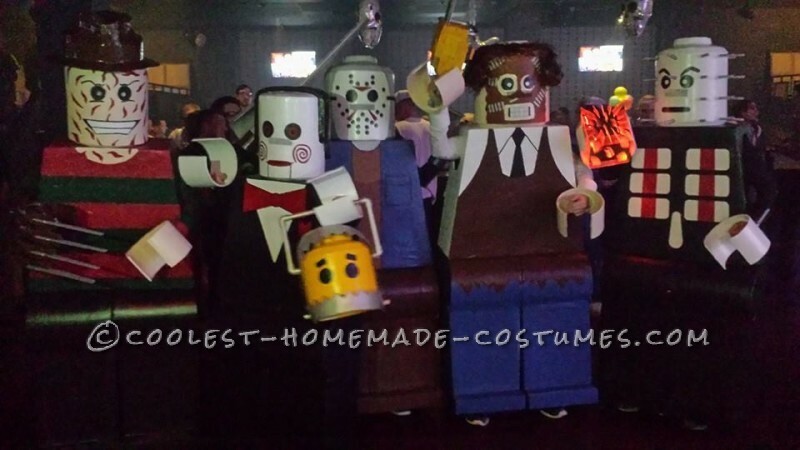 I think everyone really enjoyed the costume because of how popular the Lego Man movie was this year, and that there was a group of five of us!